…A demon squirrel attacked me. Yes, and there were three witnesses. It was the perfect setting for a horror movie. Back to the story. I was walking with a friend. There were two one cute and one demon squirrels under a large oak tree just off the sidewalk. The cute squirrel was eating an acorn. 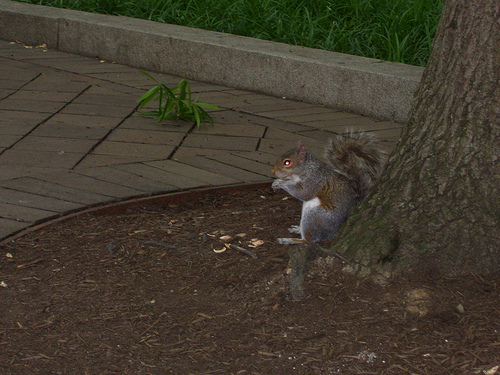 The other demon squirrel was looking at us. It was watching us. The staring demon squirrel darted toward the sidewalk as if in a mad dash to cross a road before becoming road kill. He overshot the sidewalk and we kept walking. Suddenly, there was something on the back of my bare leg. I was wearing shorts, not jeans. In a horror movie, I would think it was nothing harmful or that it was something playful–and I would be very wrong. The demon squirrel had jumped onto my leg. What the heck? Tiny, gerbil-like demon squirrel claws were sliding down my leg. I saw only the flash of the demon squirrel’s tail as I turned from side to side–bushy, brown tail no matter which way I turned. I experienced a moment of complete paralysis. The demon squirrel slid all the way down my bare leg and ran to the oak tree where it stared us down with glowing red eyes. Maybe the demon squirrel’s eyes weren’t glowing red, but they would be in a horror movie. The other two witnesses were as stunned as I was. I’m pretty sure they were both ROTFLTAO after they showed a little concern for me and then disappeared into a building. Over time, I’ve been able to forgive the demon squirrel for being possessed protective of its acorn tree. You have no idea how glad I am that this happened before cell phone cameras and YouTube (yes, that was a looonngg time ago). My friend would have captured it on video and posted it online before the adrenaline left me shaking and in shock. Here’s video of an angry squirrel. I could’ve sworn its eyes glowed briefly. It could be the same demon squirrel. It’s a good thing my experience wasn’t a horror movie. If it had been, the bystander who did nothing to assist the first victim would have been the second victim. My friend might have been pelted with acorns by a demon-possessed squirrel with red, glowing eyes. Go see this illustration of a squirrel by Ryan Green (his squirrel-ish story is funny, too). The bunny ears do seem to make the creature less scary. My demon squirrel would benefit from ears like that. Do you have any squirrel or wild animal experiences stories to tell? Share them in the comments below. Happy 2018! Time to Plan! Any and all material on this blog, unless otherwise stated, are the work, intellectual material, and property of the sole creator of this blog, namely Diana Beebe.